When I saw this beautiful gate I was speechless. Stood there just admiring this magnificent majestic artistic creation. I forgot that it was noon time in month of April and anyone can imagine the heat, temperature during summer times in Kanpur. It is Nice example of Indian Architecture. How much time, patience, hard work might have gone into building this? I forgot hot scorching sun over my head. I was just standing and watching this building. Many intricate carvings are very beautiful. 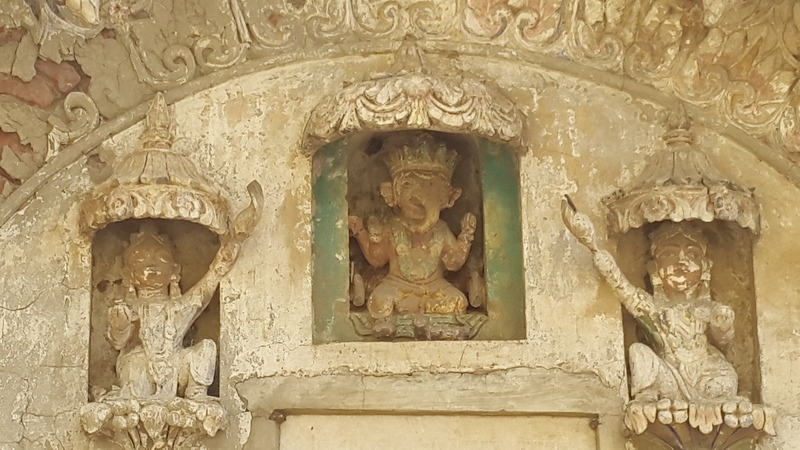 See this detail of carving on gate. 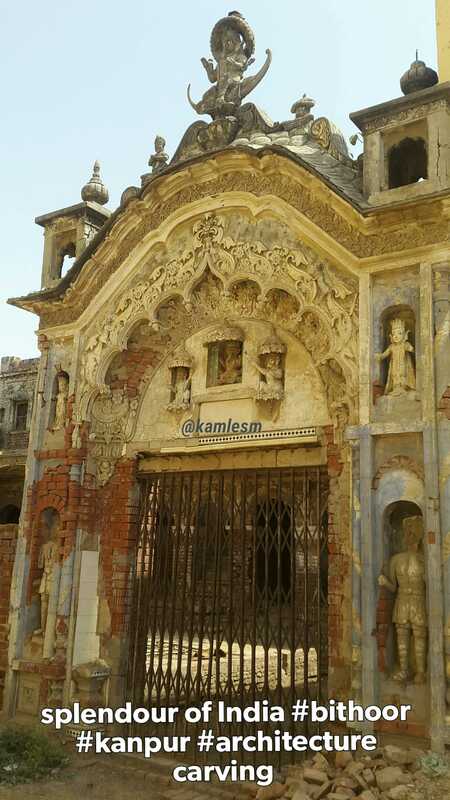 I presume this is Goddess Ganga on top of gate. As Aligator मगर वाहन is prominently present there. In one hand deity is holding a pot may be it is Ganga jal गंगाजल or Amrit अमृत. But on second look the statue doesnt look like a goddess? is it Vishnu? or Kuber? but since it is riding on an Aligator? Over time such beautiful buildings are crumbling, partly due to neglect, ignorance, lack of resources either financial or commitment. In era of commercialization where even family relations or bonds are neglected how can we presume that our rich tradition of art can be given priority? As tempo reaches near the river bank it halted just few metres before Pathar ghat in Bithoor, Some problem in engine was noticed by driver. We were disembarke. Just as I turned to my left there stood this magnificent remainent of a beautiful building. 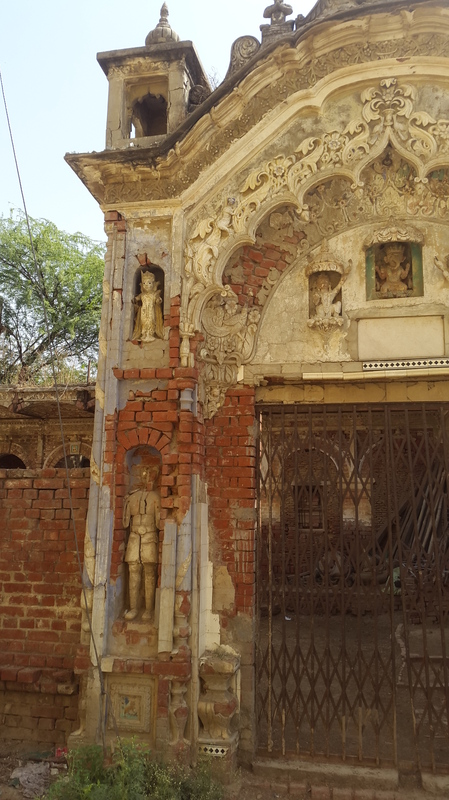 It’s obvious with intricate design on whole of building that it was work of passion dedication but now a picture of neglect. I don’t think this will be there in coming time. I don’t know how to save it. But I just clicked it to save it’s sight in my camera. 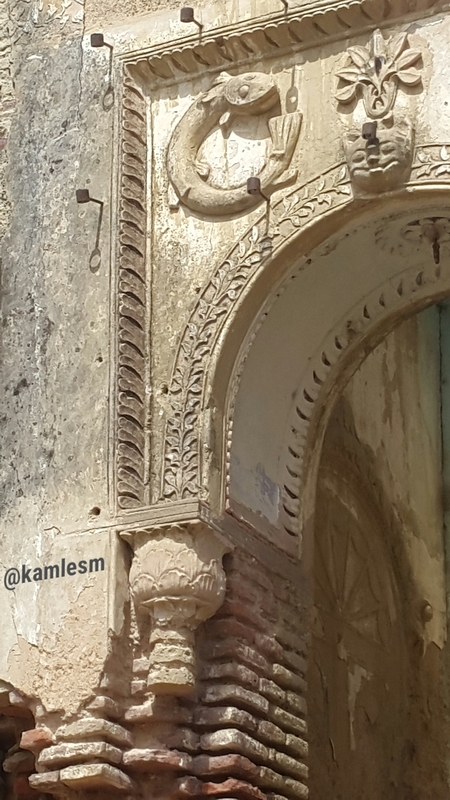 It has the famous symbol of two fish, much prevalent in Awadh area. This is considered auspicious. 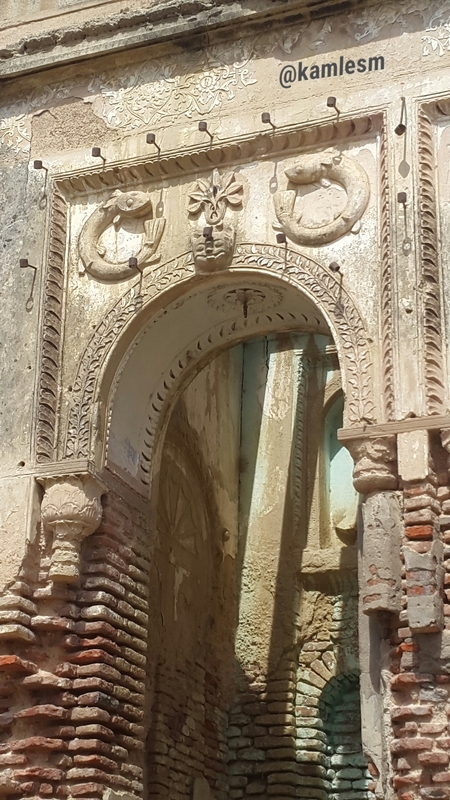 But I thought whether such symbol could have been made on a religious building such as Temple. Or it was an official building? It could have been a residential building also. I will certainly try to know on my next trip to Bithoor, Kanpur. It was made from the smaller bricks. Such bricks and still smaller than this were prevalent in that time. Often called as गिट्टी ईंट Gitti. The plaster was applied on outer surface. It was so good that seeing it can’t be guessed whether inside are these Gitti bricks. I had heard the masala mix had urad dal, methi-fenugreek in it so as to make it binding. I dont know why that brick was called as lakhauri? Below is a burj kind of thing, standing over there i could see large span of River Ganga (Ganges), it’s bank, people dipping in water, people performing pooja-whole bank of river was full of people. So much devotion-faith people had for River Mother Goddess Ganga. Inspite of scorching hot temperature people gathered on the river bank. 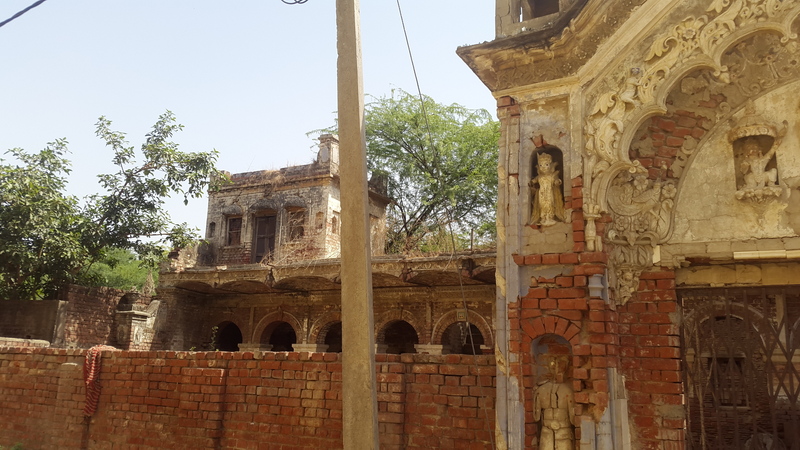 This building in white colour is a resting place for pilgrims, visiting Bithoor. built by a talukedar-raja Tikait Rai, as written-mentioned on this board. Tikait rai pond is also i heard in Lucknow near to it one of my uncle lives. 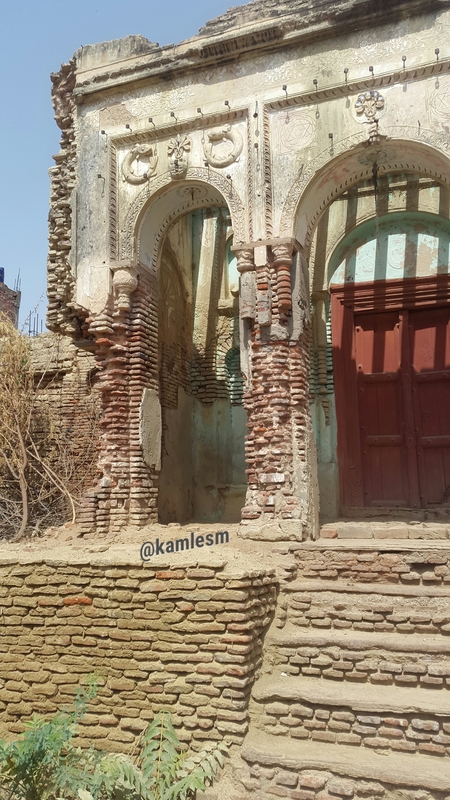 In those times patrons-rulers etc used to build such places for pilgrims by act of this they tried to earn -Punya पुन्य as concept of पाप & पुन्य was prevalent. Now days term CSR is making round-Corporate Social Responsibility-as it is called. 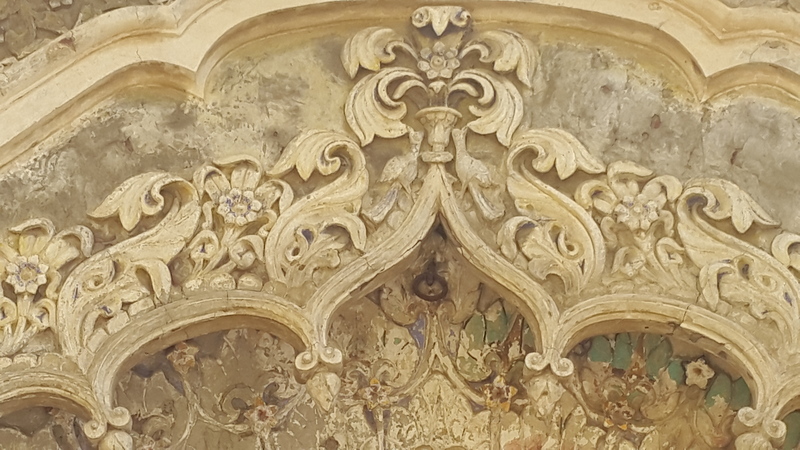 This is seen when you walk through the Memorial built at Bithoor, This is said to be the portion of the Palace of Peshwa. He was referred as Maharaja in Bithoor and surrounding villages. This nice piece of Palace is just going to ruin. Bank of River Ganga whom we address mother Ganga offers a place where hordes of people gather and perform many rituals. Aged old tradition are followed by people. They come from far off places to perform rituals. This is photo when I went with a family to perform the ritual Mundan, Hair removing for the first time of a child. Such occasions offer many opportunities of livelihood, employment generation to the locals and as well as people from various adjoining places. They come here in hope of earning something while people gather to perform religious social rituals at such bank of rivers. This is Bithoor.